Let’s Go Sledding! Christmas mini session announcement! It’s getting close, everyone – CHRISTMAS! Time to book a studio mini session for your kids or well-behaved fur-baby (or furry kids and well-behaved babies lol). Get yourself organized and ahead of the game this year. Don’t procrastinate! This year’s session is super easy to plan for – anything goes! Casual, dressy, or outerwear – it all looks cute on this backdrop. For example, I was in a hurry to get this announcement up so I just slapped coats and hats (ain’t no one got time for hair) on my shorties, tossed them some snowballs, and voila! 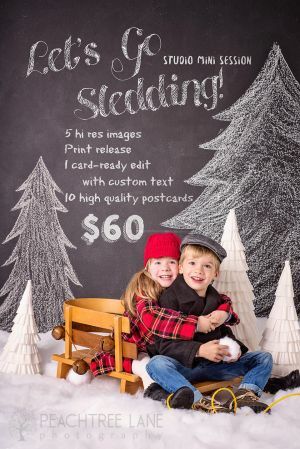 For $60 you get 5 high resolution images with print release (delivered via Dropbox), 1 card-ready edit with custom chalkboard text (you supply message), AND 10 high quality postcards (delivered to you 2-3 weeks after your session). I will be booking 30 minute sessions by appointment only now through the end of November (starting the beginning of December I’ll be offering a special Happy New Year mini session). Please contact me via email here on my website or message me over on the Facebook to make your appointment! This entry was posted in Christmas, Family Photography, holidays, Metamora IL, Mini Sessions and tagged child photography, Christmas Mini Session, east peoria photographer, family photography, family portraits, germantown hills photography, holiday mini session, metamora il photography, peoria illinois photographer, photography mini session. love this–a bit retro–little kiddos happy smiles at Christmas–great picture!! This is beautiful. Your subjects are very endearing!